He finally reached the end of the hall and looked at the door. It wasn’t like the ordinary wooden swing-open doors that you usually see. It had strange drawings of intricate swirling lines that would form at one point to make a river and disconnect at another point to make two trees. And stranger still was the method of opening it. It had no knobs or handles, or even levers. Instead, it only opened if you willed it to open. Cain thought about what was beyond the door, came to the decision that it was definitely a flesh-rending beast, and he walked up to the said door. After a few more moments of contemplation and after running his fingers down the blade of his sword nervously, he finally willed that he wanted to get in the room beyond. The door opened with a squelching noise and he stepped inside. At first he saw nothing. The room looked empty save some pillars jutting up and connecting to the surrounding walls of the round room and a few drawings that reached up to the very high ceiling. The drawings disturbed Cain the most, for he knew they weren’t ordinary. They depicted a scene where a hero in black elfish clothing is getting his limbs dismembered by a great bear-like creature with a horn. The scene looked like it was supposed to take place in the very room he was standing in, and Cain took off his black elfish-woven hat and stuck it in his pack and tensed himself for battle. Not a moment after he had gotten himself ready then had the picture itself start seeping out of the wall. The paint was slithering down the wall and disappearing into the cracks. He heard pounding footsteps and he rolled to the side just in time to see the bear creature burst through the former drawing wall trampling over where he had just been standing. He wasted no time as he quickly picked himself up and lunged back at the creature. It was big, but agile, and Cain found himself on the ground with his sword held tense. He couldn’t waste time mourning a miss, as the bear ran around and U-turned back at where Cain was standing. He jumped up and the bear grazed his leg with its horn. When he landed, he ran full speed at the bear, which was still running towards the opposite wall. The bear turned around to hit Cain and instead met the full force of an upper jab. It fell to the grand roaring and screeching, blood sputtering from the whole in its lower jaw. But as it died something strange happened. It roared, but Cain could’ve sworn he could hear words. It sounded like “Dorg usha glit agg, dorg tooken flet ugk”. To anyone else it would’ve sounded like the normal dying roars of a beast, but to Cain’s trained warrior ears, he knew it wasn’t gibberish. He walked over to the bear’s dying body and skillfully cut around the edges of the horn with his blade. When he went full-circle around it, he pulled it out of the bear’s head. He reached into his pack and pulled out his black hat and a bottle of water. He put the hat back on his head and poured the water over the horn. The blood washed off after he rubbed it with a piece of cloth from his pack. He stuck the clean horn in his pack with the empty bottle and looked around the room again. There were no other doors he could see besides the one he came in, but upon closer inspection of the wall that the bear had leapt through, there was a small door just to the side of a crumbling bit of wall. He once again ran his fingers down his blade nervously, then resolutely willed the door to open. He expected to see a beast bigger then the last, and more powerful to boot, waiting for him in that room, but instead all he found was an empty room. But instead of having pillars and drawings, this room simply had a treasure chest sitting in the middle of it. Cain took a good hard look and stopped. He was still keeping his distance, knowing that looks are deceiving. He sheathed his sword and from his trusty pack he drew his bow. He nocked an arrow and shot with deadly accuracy. The arrow went straight into the lock on the chest, opening it. The arrow jiggled and was pulled into the chest and an imp fell out of the open chest. 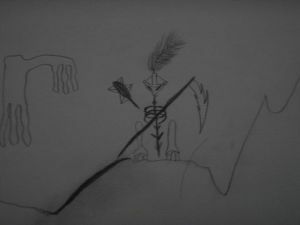 An arrow was protruding from its chest. Cain was still tense. Monsters often wore disguises and the rooms in the dungeons were often more then they appeared to be. He took a step forward and the chest moved slightly. He didn’t see it the first time, but when he stepped again, the chest wriggled again, a little more violently. This time not daring to step forward again, he took his bow and nocked another arrow. This time he aimed at the floor a few feet in front of him. The chest was moving so violently it nearly fell over. That’s when he saw it. The chest toppled over revealing a hole under it. Out of the hole sprouted a small blue plant. It grew quickly and got dreadfully big. It was now cracking the floor as it grew too thick for its hole. It now had a grotesque head that had fat blue lips and beady yellow eyes. Its lips were apart and a long blue tongue was lolling. It had long droopy leaves growing out of its sides that were set in front of it like long, blue arms. It had a green spread of leaves behind its head, making it look like strange flower. It stared at Cain, who was awestruck at the site. Finally it made a few short wheezing noises, which a perceptive person might consider laughs. Then it spoke! Cain was once again struck motionless. It hadn’t only spoke, it had repeated what the dying bear had said! But Cain was suddenly filled with rage. This flower was laughing at him! “Who are you to laugh at the mighty Cain?” he said in anger. This was sick. Overcoming every obstacle in the dungeon, he ends up in a room with a giant blue salad fixing that mocked him. Cain could hardly stand it. It was speaking in a strange tongue that he had never heard before. If he couldn’t understand it, he could never get it to stop laughing at him. But then, Cain wasn’t the negotiating type anyway. “No one laughs at Cain!” Cain shouted and charged. The plant creature wasn’t prepared at all. Cain came swift like a hurricane, quickly jumping, then slicing its body to gain more momentum, effectively bringing himself to the top of the plant’s head while striking it. The plant was unprepared at first, but when Cain reached its head, it tilted its head upward, tossing him across the room. The creature wasn’t laughing anymore. It was reaching out with its plant-arms and slamming them at Cain. Slow as it was, it missed as he dodged with great agility. Finally, Cain jumped up and sliced through the plant’s middle. It was silent with surprise for a bit. Then it squealed in rage, wobbled for a little bit, then fell over, ripping out its roots. Cain walked over and cut every root he saw, just to make sure. Then he walked over to the dead plants head and began stomping it into the ground. When he was finally empty of all his rage toward the creature, he looked at the hole and the fake treasure chest. Then thinking for a little bit, he thought maybe it wasn’t a fake. He walked over to it and searched it and found what he was looking for. Etched into the side of the chest was the shape of a small key. He used his sword to wedge it out of the chest’s side and put it in his pack. Then he looked back to the door he had walked through. It was time to leave the dungeon, and its nasty creatures. It was finally time for him to get out of the horrible place and back into the safety of the outer world. With this key, he could enter the place where his quest would finally end. He could enter the room beyond. Let's see...you are only thirteen...and this is written quite well! You've inspired me to dig through my old computer files and someday try and upload written work! I've loved writing for as long as I've known, i once wrote a 50 page story! but it was incomplete and not very well written, but i did learn alot from it. Glad i can inspire some people. Well, I have been working on a novel for the past couple years...and maybe I could post a chapter or two? How smart of being is he? Or for that matter, where is he from and how did get where is at? More is needed I say, more! all is to be explained, in due course. if i told you everything at the beginning, there wouldn't be much to read for, would there? Nice. You did a very good job with the fight scenes, those are hard to write and I know! the room beyond will be revealed......with time. I'm watching you as well, can't wait for more buttloads of your writing, war peices are hard to write. wow, thanks for fulfilling your duty as "Advanced Critique Welcome" persona. I'm gonna have to try harder to be more specific in my own critiques. The next morning, down by the waterfall in the Eastern country, you lay fast asleep in Coatl's arms. Outside, birds are tweeping loudly; it's most likely early morning. You rouse, then carefully remove yourself from Coatl's grasp. He is so much bigger than you. In length, about 15 of you, height, about 4. The sun seeping through the gaps in the waterfall bounce off his scales, creating a magical dancing pattern on the walls of the stone cave. He is metallic blue in colour, with silver wing membranes. His eyes are crystal silver flecked with amber. He stood over the body. It's over, he thought. No more. I'm not like them, their traditions, rituals, this pack... I'm different. It's over for me. The scent of blood was overwhelming. The heat from the fire only reminded him of the hate that grew within him. I hate them, he repeated over and over in his head. How could they, and for what, they call this honor!? He wanted to see them burn. Fire didn't seem enough. He could only think of the worst kinds of deaths one could experience, and he wished it on them. He was alone. It was not what he wanted, but it was all his fault. He had taken everything too far. My lies did this. My hope to be different. He had lived with his curse long enough, he was asked to do the only thing he vowed never to do. "I will not!" Andrew yelled out in the darkness. Shadows moved across the field. Glowing eyes were on him, fueled by hatred and judgment. He didn't care. He wouldn't stand it.